I was actually going to present before you a compote with an ice cream. I had cooked some cream with vanilla bean wanting a well made ice cream with natural flavours. When I had everything ready, my ice cream maker gave way and I had to think of other ways to put my prepared cream to best use. Not being able to make an ice cream as planned proved to be a dissappointment for a very short duration. I thought of a vanilla custard or pudding which had milk, cream and eggs. I stirred in some cornflour which is an excellent egg substitute in baked puddings and desserts into my prepared cream and baked them in little bowls and ramekins. 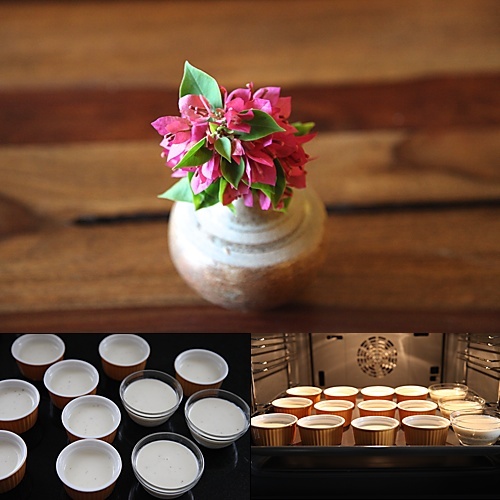 Cream, milk, sugar, vanilla and cornflour, just a few ingredients had gotten together and created magic in the little pots giving spoonfuls of delight to everyone who tasted it. I’m so happy that my icecream maker gave way, if not I wouldnt have made this delicious discovery. 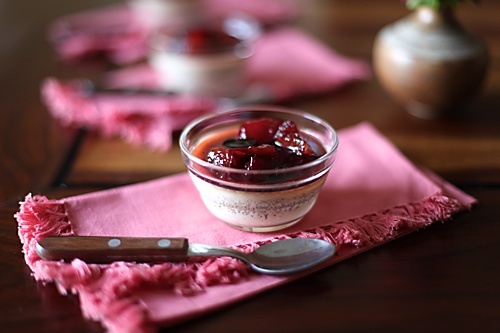 This pudding is plain yet fragrant with vanilla and it can play the lead being served alone or be a supporting character to something else, in this case the compote and always emerge a winner. The tiny vanilla seeds look absolutely stunning against the creamy white background adding relish to every bit. It can be eaten as it is or with numerous toppings and I can already think of a number of ways to serve this pudding. I love vanilla so much, not just in my food but in my perfumes too and will almost always choose a fragrance with strong hints of vanilla in it. When I bake or cook with vanilla and use the pod instead of the extract, I can’t stop myself from smelling my hands again and again taking in the delicate aroma of one of my favourite spices. I also love the cinnamon and was overwhelmed to receive a huge packet of organic Srilankan cinnamon from a family friend a few days ago. 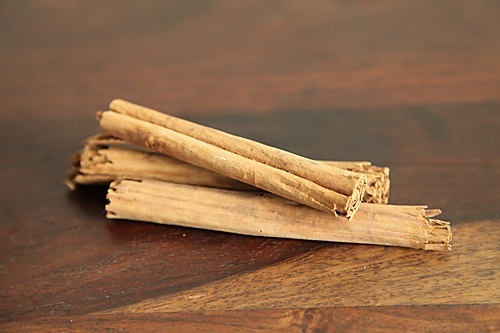 Cinnamon is often confused with cassia. Cassia is native to India while the cinnamon is grown in Srilanka. Cassia is the bark of a tree which is much thicker, darker and coarser in comparison to cinnamon. The inner filling of cinnamon is like a cigar while the cassia is hollow inside when rolled. The cassia with its strong flavours is more suited for savoury dishes and the delicately sweet cinnamon is best for sweet desserts and puddings. I was in total awe of the cinnamon, when I discovered that the humble cassia works best in a savoury dish like a biriyani. Each spice has a story to tell! 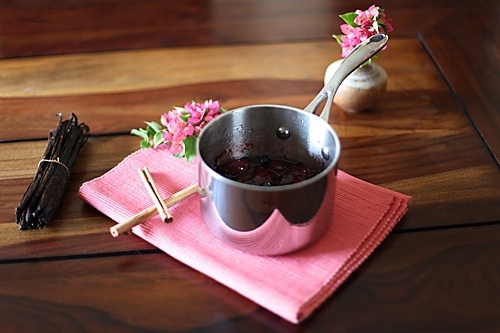 A compote is an old English dessert made by cooking fruits and spices like vanilla, citrus peels, cloves, candied ginger and cinnamon in sugar syrup. 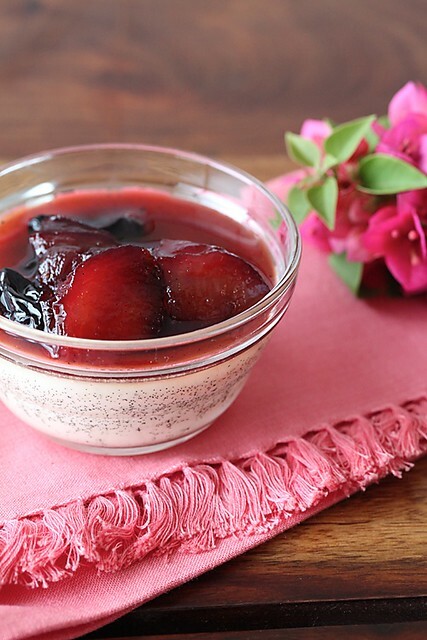 In this compote I have used only cinnamon and vanilla with black raisins and plums. The syrup cooked to a beautiful ruby red colour and the fruits were imbued with the wonderful and exotic flavours of cinnamon and vanilla. It was so delicious that it could be eaten as it is. Both the vanilla pudding and the compote have strong individual flavours but together they create a delightful harmony, pleasing the eye, the nose and the palate. Passionate baker and blogger Deeba is hosting Meeta's monthly mingle with the theme “Fruit in Baking”. I’m sending these little pots of fruity delight to her online party. In a sauce pan mix the cream, milk and sugar. Slit the vanila bean, cut it into half and scrape the insides with the tip of a knife and put it along with the bean into the cream. Cook on low heat, stirring all the while until the sugar dissolves completely and the cream comes to a simmer. Allow to cool and refrigerate overnight for the vanilla flavours to seep into the cream. If in a hurry, refrigerate for 2 to 3 hours. Preheat the oven to 180 C/ 350F. Remove the bean and stir in the cornflour and with a whisk, mix till smooth and creamy with no lumps. Pour this into ramekins or any other oven proof bowls and bake for 25 minutes. Allow to cool and refrigerate for 1 hour or more before serving. In a sauce pan, put in the sugar and water with the cinnamon and vanilla and cook until the sugar dissolves. 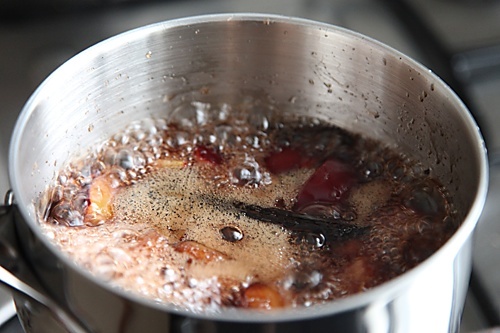 Put in the raisins and plums and continue to cook for 10 minutes or more until you get a thick syrup infused with the flavours of the fruits and spices. Spoon a few spoons of the syrup along with the fruits over the chilled vanilla pudding. looks absolutely delightful anushruti! creamy pudding with spiced fruits just up my alley! Anu,this must be one of the best looking desserts I've seen ever..the bowls look too pretty to be eaten!!Lovely!! Just gorgeous A…you know fruit in desserts is right up my street. Love them!! I love those vanilla specs too, gives it so gourmet a look!! Hi Anushruti, I could feel my taste buds enliven when I looked at the pictures and almost tasted the compote when I starting reading 😉 It is simply awesome and the pictures are so very full of life! Thank you everybody. Love to get feedback from all of you. 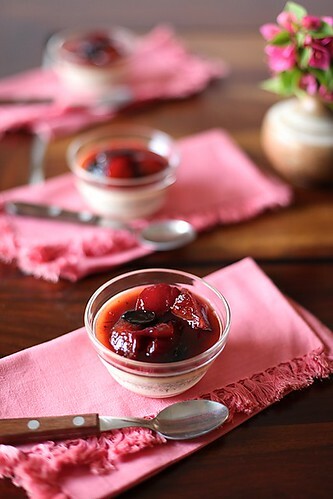 Oh this custard is so much more perfect than ice cream for this rainy season and I absolutely love the simple, creamy vanilla custard with the fabulous fruit compote. Gorgeous! Anu..this looks soo perfect! i may gobble up the bowl too 🙂 Superb photography. Cannot wait to try this recipe..will let you know how it turned out. Also, i love your props! very very creative 🙂 keep going! grt job! I ma going to prepare the vanilla pudding and instead of compote going to serve it with hot Theratipal/pal kova. Will let you know how it went. Your pictures came out beautiful. I love the styling. And the dessert is so elegant. I cant still taste this. It was Drop dead gorgeous. Thank you, And Hats off to you for creating such a beautiful recipe! Eggless creations rock! Love your pictures. I much prefer a baked custard pud to ice-cream. I really like your comment about every spice having a story. Is whipped cream the "low fat cream"? I made this recipe with whipped cream and strawberry-raisin compote. Came out delicious. But the pudding was a bit soggy, thought could have been little more solid (consistency like yogurt). Any tips? sun: Nope. Whipped cream is not low fat cream. Whipping cream usually has a butter fat content of 35 to 40% whereas the low fat cream I used was 25% fat. If you use full fat cream you might have to increase the cornflour/cornstarch by an additional tablespoon to get a firmer texture. Thanks Anushruti for the response. I used fat free whipped cream. Sun: I doubt you will get this texture right with fat free cream. Use 35 to 40% whipping cream if low fat cream is not available. This looks soooooooo delicious! YUM!! You've introduced a unique persective, thanks for giving me something to consider. At last a post I find useful. I have read some useless stuff today, so its nice to read something decent. What an amazing recipe and wonderful blog, i am a regular visitor here. I am amazed at your creativity and totally bowled over by your collection of kitchen items, be it cookware, serve ware or the gadgets, where do you buy it from. I totally love the sauce pan in the recipe, could you please tell me which brand it is and where can i but it from? I stumbled upon your site relatively recently and have been hooked to it since. I cannot thank you enough for the work you are doing and helping people like me take satvik cooking to a different level. You have also inspired me to bake with your lovely recipes, and a few recipes I have already tried have been a success. I hope to try a few more of your cake recipes. Thank you once again. I have a query for you-is vanilla extract different from the vanilla essence we find on the shelves in the market? If so, is there a place I can buy vanilla extract from in Bangalore? Please also let me know if there is any way to use the vanilla bean you have mentioned in this recipe (I have access to it) in other recipes, such as cakes or cookies (like for example, can I dry and grind it and then use it in place of the extract? ).